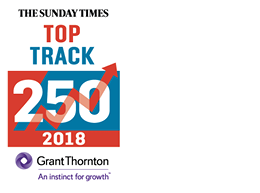 The Sunday Times Grant Thornton Top Track 250 complements the Top Track 100, published in July, which features Britain’s biggest private companies. It ranks the next 250-biggest companies by sales, provided they meet our growth and profitability criteria. The 250 companies grew combined sales by 16% to £62.4bn, operating profits by 34% to a record £5.4bn, and staff by 10% to 384,200. There are 120 companies that were not on the league table in 2016, 39 of which have appeared on the league table previously, while the remaining 81 make their debuts this year. The 250 companies are headquartered across the country. London is home to 68 companies and the southeast 46. Yorkshire has 29, Scotland 22, the northwest 21, the West Midlands 17, east 15, southwest 11, the East Midlands 8, Northern Ireland 7, and Wales and the northeast have 3 each.